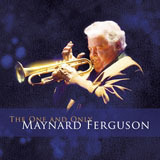 Throughout his sixty-plus year career, Maynard Ferguson featured numerous sidemen on varying arrangements of jazz standards, covers of pop hits and original songs. As a young man, he performed with such legends as Count Basie, Dizzy Gillespie and Stan Kenton. As a bandleader, his stage band and studio guests included a virtual who's who of jazz, including Bob James, David Sanborn, Nathan East, Stanley Clarke, George Benson and Steve Gadd. Born in Canada but living in the United States for much of his life, Ferguson has done it all. Big bands and small ensembles, he's played straight jazz, Latin, Brazilian, swing and many other styles. Though criticized by jazz purists for crossing over into pop, Ferguson continued to score hits, pack houses and achieve honors, including a Grammy nomination for his cover of "Gonna Fly Now (Theme from Rocky) and Down Beat Magazine's "Down Beat award. 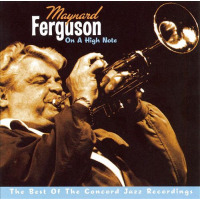 With his Big Bop Nouveau Band, the 78-year-old Ferguson completed recording The One and Only Maynard Ferguson just three weeks before his death on August 23, 2006. This selection of nine songs includes several standards, three originals penned by longtime band member and baritone saxophonist Denis DiBlasio, and an original by Ferguson's son-in-law, pianist Christian Jacob. Saxophonist Chip McNeill contributes the upbeat arrangement of the standard "Without a Song. This nearly nine-minute track features McNeill's energetic soprano sax and a piano solo by Jeff Lashway. Ferguson and Serafin Aguilar are featured on trumpet. Trombonist Steve Weist contributes the arrangement to Bill Withers' "Ain't No Sunshine When She's Gone. With the main melody in 12/8, the band swings before changing to a more laid-back tempo, where Weist delivers a brassy solo, followed by McNeill on tenor. Ferguson's trumpet screams with crystal-clear intensity. Music education has also been a large part of Ferguson's life, as he and many of his band members have taught in addition to performing. It's only fitting that one of DiBlasio's compositions is "Dr. Fox Ph.D., a tribute to Ferguson's receiving an honorary doctorate from Rowan University. DiBlasio calls it a huge nod to Ferguson as one of the greatest jazz educators on the planet, nicknamed "Fox by fans and players during his Birdland Dream Band days. This blistering piece features Ferguson on trumpet and Mike Dubaniewicz on alto. DiBlasio's "Surviving Soho, inspired by an experience the band had in London, England is another high-energy track. The saxophones set the pace early, but this song is an all-out effort by the band, with Ferguson out front most of the way, aided by a frenetic tenor solo by McNeill. 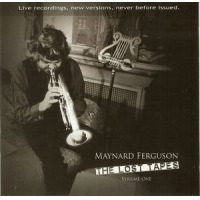 With Lashway, trumpeter Wayne Bergeron, bassist Brian Mulholland and drummer Stockton Helbing figuring prominently, Maynard Ferguson and his Big Bop Nouveau Band are in the groove from start to finish. 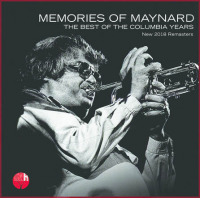 Longtime fans and those hearing him for the first time will not be disappointed with The One and Only Maynard Ferguson. It's classic jazz for the modern day. 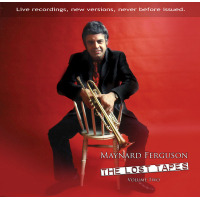 Personnel: Maynard Ferguson: trumpet, flugelhorn; Wayne Bergeron: trumpet and flugelhorn (lead 1-4, 6); Patrick Hession: trumpet and flugelhorn (lead 5, 7-9); Serafin Aguilar: trumpet and flugelhorn; Ken Edwards: trumpet and flugelhorn; Mike Dubaniewicz: alto saxophone; Chip McNeill: tenor and soprano saxophones; Denis DiBlasio: baritone saxophone; Steve Weist: trombone; Jeff Lashway: piano; Brian Mulholland: bass; Stockton Helbing: drums and cymbals; Christian Jacob: piano.